Scheduled to open to traffic in 2015, construction of Brisbane City Council's $.5 billion, 4.6km Legacy Way tunnel began in early 2011, managed by a unique joint venture between Brisbane-based BMD Constructions, Italian Company Ghella and Spanish company Acciona - collectively called Transcity. 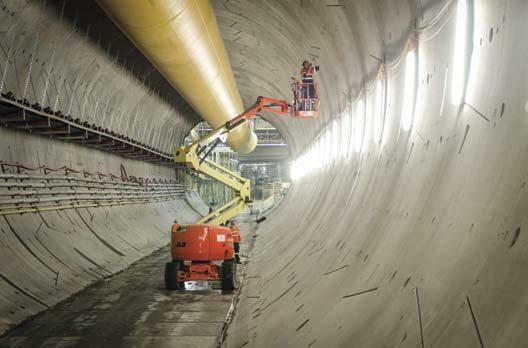 Communication is one of the most fundamental safety elements in any construction project and is particularly critical for a major tunneling operation. Together with experienced technology partner Trans Communications, Motorola has delivered a highly effective hybrid analogue and digital two-way radio system that ensures anytime, anywhere communications throughout the tunnel construction site. Supported by a microwave digital backup and Sigma leaky feed backbone and head end system that span the full length of the site, the new radio network keeps TransCity teams safely connected 24/7. Brisbane-based Motorola partner Trans Communications was chosen to design and supply the radio system for Legacy Way following a comprehensive market tender. The system comprises three "leaky" feeder cables that provide both transmission and reception for the radio handsets in the tunnels, one high power surface amplifier for surface communications and approximately 30 base stations mainly installed into the construction vehicles on site but also on each of the TBM's. "Trans Communications' availability and keen interest in the project made them stand out when we were considering who to partner with on this project" says Pinheiro (Electronic Engineer). "They gave us all the answers we needed and they had the experience to match their enthusiasm. They have been a fantastic partner throughout with their efficiency and skills in the field proving invaluable on a project of this magnitude. "As far as I know this is the first system of its kind deployed in Australia - and possibly the world - that provides all the utility, flexibility, capacity and safety features we wanted in one integrated solution", says Pinheiro. "That's largely down to the skills, experience and service of the Trans Communications and Motorola teams, always ready with a positive solution to our challenges". 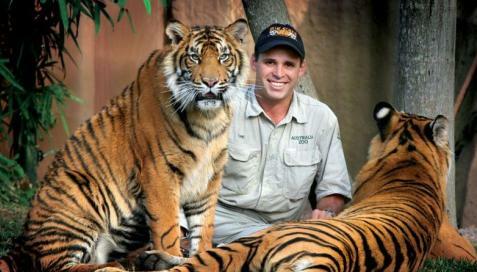 Australia Zoo’s Big Cats Mean Big Safety Needs! “ Without the radios we wouldn’t survive, they’re an essential tool. We’re very reliant on them, and they are only becoming more and more critical as the zoo keeps growing and covering a larger area with different sections.” Bill Stretton, stores coordinator, Australia Zoo. people are always far away from each other but must be able to communicate”. Over two years Vertex Standard VX454 commercial analogue radios have been rolled out throughout the zoo’s ten departments, including grounds, building and construction, keepers, big cats and the new Africa exhibit. Capacity Plus software manages repeater channel availability which allows the next available channel to be handed over to a talk group. In the past with conventional analogue repeaters, a specific repeater was assigned to a specific talk group. At times this lead to some repeater channels being congested and other repeater channels underutilised. With Capacity Plus however, more flexibility is obtained as access to the repeater channels (talk groups) is more likely. 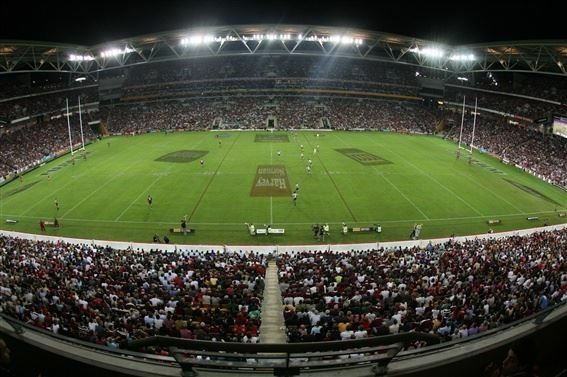 Trans Communications duplicated the Suncorp Stadium model for the Brisbane Entertainment Centre and achieved the same excellent results. In addition to the Suncorp Stadium however, we also supplied and installed a telephone interconnect panel, allowing MOTOTRBO radios to make and receive telephone calls. 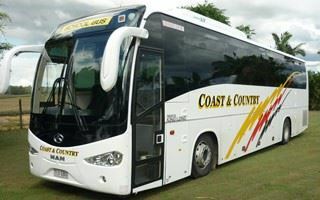 Coast and Country Buses is a family owned business that has been operating for over 25 years. The business started out with one bus and a local school run, and have grown to a fleet of over fifty vehicles servicing local schools throughout South East Queensland. Their vehicles range from 13 seat mini-vans through to 57 seat Tour Coaches. We have recently, and with great success, upgraded their fleet of communications in all school buses and coaches to the latest Qcom Digital Allova Network radios, which operate on the Telstra Public Telephone network. “The Qcom Digital System, after some extensive trialing, was found to be excellent form a functionality point of view, as well as value for money.